Discover a part of Northern Virginia’s industrial heritage — the restored gristmill at Aldie Mill Historic Park, in Aldie. Built between 1807 and 1809, the Aldie Gristmill was once the largest factory of its kind in Loudoun County. The mill's tandem metal waterwheels are fully operational, making it possible for visitors to watch live grinding demonstrations. Aldie Mill is available to rent for events and meetings. Tours and demonstrations are available during weekends between April and November. 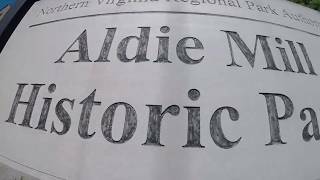 Aldie Mill is open for tours and grinding demonstrations on weekends. Group tours can be accommodated on weekdays by appointment. The Aldie Mill volunteer program welcomes docents interested in working in a variety of positions, including interpreters, greeters, clerical assistants, researchers, and many other duties. Mill volunteers attend a training workshop every April and participate in the Mill’s special events. Volunteers also received a 10% discount on purchases for all merchandise sold at the Mill. Other benefits include receiving special news bulletins and advance announcements of new programs and events.